Home › Updates › Enjoy A Fabulous 50% Off February! 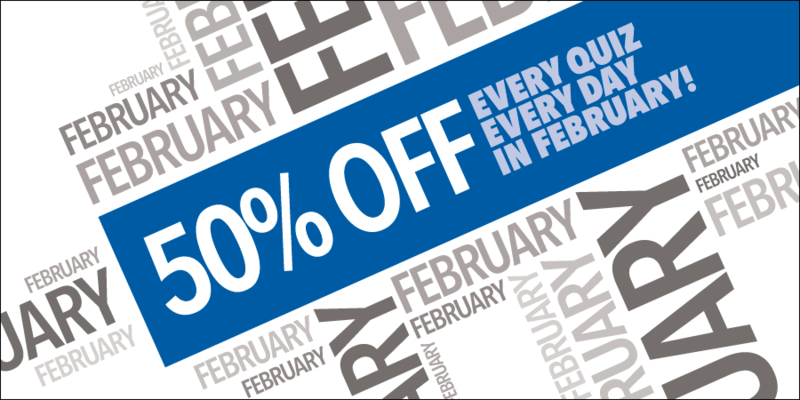 Fancy a 50% discount on every Quiz you purchase in February? Yes, you read it right, every single Quiz you buy in February could be half price! No catch. All you need to do is sign up to The QuizMaker Mailing List, our monthly bulletin that we send out to highlight the latest Quizzes uploaded, the current Quiz for a Quid and your exclusive member discount codes. Plus when you become a member we give you a code with which you can download any Quiz on the site for free! We only send out the one bulletin every month so rest assured you won’t be bombarded with endless email nonsense and don’t worry, we don’t share our member list with anyone… we value your membership! After a few minutes you will get an email to confirm you wish to subscribe to our Mailing list. You will then be presented with a page asking you to ‘Confirm Humanity’. Yes I know, ridiculous… but this is what internet security is like these days! That’s it. You are subscribed to The QuizMaker Mailing List! That’s it, thanks for subscribing and enjoy your free download plus an entire month of half-price Quizzes!